Patterson Pope loves working with the businesses and organizations in Cleveland, Ohio. Why? Cleveland is home to cool museums, the rock-n-roll hall of fame and several sports teams. With all of that going on, you simply cannot be bogged down by storage problems. We are here to help. There is no item too small or too large for Patterson Pope. From tiny medical tools to crate-sized boxes, we have a product that will store it and make it easy to retrieve. Contact Us Today to learn more about how Patterson Pope’s customized mobile shelving and high desnity storage solutions can help your Cleveland business or need! If you are wondering why that list is so long, think about it this way – every industry has unique building settings, items to store and different levels of security precautions. So we wouldn’t be considered a leader in the high density storage business in Cleveland if we were unable to provide solutions for every industry. 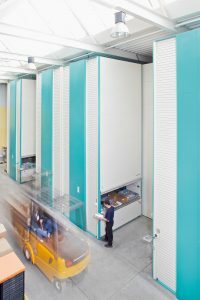 Our automated retrieval systems are perfect for industrial warehouses and commercial buildings with high ceilings. Vertical space is not easy to take advantage of, but we make it possible with our industrial vertical carousel and industrial vertical lift. When it comes to our cabinets, we have plenty to choose from. 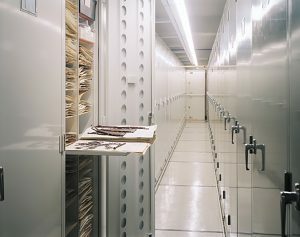 In a nutshell, our cabinet options range from evidence-drying cabinets, fireproof cabinets, modular drawer cabinets, museum cabinets, Spacesaver rotary file cabinets, lateral file cabinets and Gemtrac cabinets designed for media storage. Phew! Try saying all that three times fast! 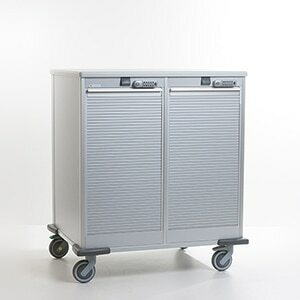 As you can imagine, carts are ideal for mobile storage needs such as bulk mail and medical supplies. We offer a variety of cart options that keep items organized while on the move. This is extremely important in places like hospitals and busy office environments. We take extra pride in our lockers. Our lockers are so secure and durable that even the military and law enforcement officers use them for their expensive gear, weaponry and optics. Our locker options include refrigerated storage (not necessarily for ice cream but for important items such as biological evidence). 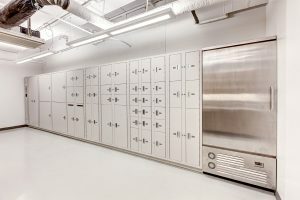 Other locker types are wall-mounted gun lockers, steel lockers, floor mounted gun lockers and freestyle personal storage lockers. We never disappoint Cleveland professionals when it comes to shelves. We offer mobile shelving, cantilever shelving, bin shelving, wide-span shelving, 4-post shelving, static high-bay shelving and a whole lot more. Click on our products page for more information on what we have to offer. If you have any questions or if you would like to talk to a representative from Patterson Pope about your unique high density storage need, please give us a call! Our team at Patterson Pope provides mobile shelving and high density storage solutions to the greater Cleveland area, including Youngstown, Akron, Toledo, Elyria, Medina, Warren, Mentor, Euclid, Sandusky, Painesville, Canton, and other surrounding areas.